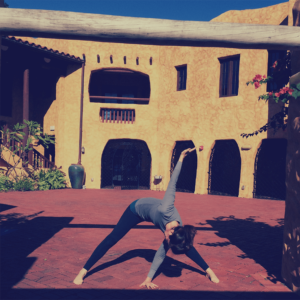 Mansion yoga teacher, Natasha, is Yoga Alliance-registered and a graduate of The American Yoga Academy in New Jersey, where she trained with Claire Diab, Master Yoga Educator of the Chopra Center. She is also a certified personal trainer and has been teaching yoga and other functional fitness programs for many years. Natasha’s yoga is considered a therapeutic and restorative workout designed to improve overall well-being physically, mentally, spiritually and emotionally. SENIOR YOGA for those 60 or over. The classes are free, but you must register prior to attending class at the Miami Springs Senior Center located at 343 Payne Drive. Classes are held at the Mansion on Tuesday and Thursday morning from 9:00 -11:00. YOGA for everyone. Each session is six weeks long, or 18 classes, and held at the Mansion on Monday and Wednesday evening from 6:30-7:30. Registration is on the first day of each session. The cost is $99 per person per session or $10 for a single class. Both types of yoga require a yoga mat and yoga block. Please wear comfortable, non-restrictive clothing. Namaste! The Curtiss Explorers is an innovation Curtiss Mansion project that kicked off during the 2014-15 school year. The first year was deemed a great success by Mansion education partner, All Angels Academy, a private, independent school located in Miami Springs. This year, Blessed Trinity School will be joining the Explorers family. The program teaches 6th – 8th grade students through a customized curriculum to effectively explore the past to benefit the future as they search for America’s unsung heroes and (s)heroes. The students learn effective and efficient research methods, how to present findings to an audience, how to write a thesis statement, and how to defend their findings to a panel of judges. The research papers will become reference sources on the Curtiss Mansion’s website at the end of the 2015-16 school year. For more information, please contact the Curtiss Mansion at 305-869-5180. The Curtiss Mansion was recently accepted by NOAA (National Oceanographic & Atmospheric Administration) as a Weather-Ready Nation Ambassador. This is a national initiative to improve the nation’s readiness, responsiveness, and overall resilience against extreme weather, water, and climatic events. The Mansion will be working in partnership with NOAA to inform the public through lectures and presentations. More information will be posted as the program develops at the Mansion. The Curtiss Mansion, in partnership with the National Inventors Hall of Fame (of which Glenn H. Curtiss is an inductee), offers the nationally-acclaimed Camp Invention program to children entering grades 1 – 6. It’s an exciting, weeklong summer adventure in Science, Technology, Engineering and Math (STEM) that’s all about big ideas – kids working together to find innovative solutions to real-world problems and sharpen critical learning skills through four modules that reinvent summer fun. The Florida Humanities Council has selected the Curtiss Mansion as one of six sites in Florida to host the 2016-17 Smithsonian Exhibit “Water/Ways.” A date will be announced shortly for the six-week exhibit. Along with the Smithsonian exhibit, the Mansion will host a variety of local exhibits and presentations about water and waterways. More information will be posted as it becomes available. As an organization, the Curtiss Mansion is proud to be an Amazon Smile partner. The charity platform provided by the online retailer helps us keep the legacy of Glenn Hammond Curtis alive and kicking! Find out more about how you can help the Curtiss Mansion and other non-profit organizations through Amazon Smile. click here to add Curtiss Manison as your preferred Amazon Smile Non-Profit.